*In addition to being Black History Month, February is also Heart Awareness month which is of particular interest to women of color as African American women face a greater threat of death from heart disease than women of other races. The Heart Truth is a national public health education campaign to raise awareness that heart disease is an unacceptable lifestyle and that women must take action to reduce their risk for heart disease. The campaign targets women over the age of 40, and across ethnicities and backgrounds through education and outreach activities. The Red Dress was created in 2002 as the official symbol of The Heart Truth campaign and was designed to inspire women to take action to protect their heart health. The Red Dress campaign spawned National Wear Red Day in which everyone is encouraged to wear the fiery color to show support for women and heart disease and to promote the Red Dress as a national symbol. On Thursday, February 11, 2010, some of today’s hottest celebrities catwalked in Red Dresses created by top designers to raise awareness of heart disease. 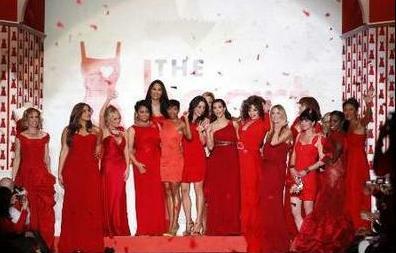 The Heart Truth’s Red Dress Collections kicked off the 2010 Mercedes-Benz Fashion Week under the Bryant park tents. Red alert fashionistas — including top designers, models, and celebrities — demonstrated their support for the issue of women and heart disease by participating in the show and dispelling the perception that heart disease is only a man’s issue. Celebrities struttin’ their stuff on the catwalk included: Bethenny Frankel, Elisabeth Hasselbeck, Felicity Huffman, Dara Torres, Estelle, Heidi Klum, Joan Collins, Jordin Sparks, Kim Kardashian, Kimora Lee, Kristin Chenoweth, Mamie Gummer, Pauley Perrette, Raven-Symoné, Regina King, Robin Roberts, and Valerie Harper. 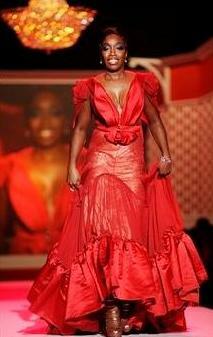 Participating designers who contributed to the 2010 Red Dress collection included: Isabella Oliver, Donna Karan, Oscar de la Renta, Rachel Roy, Zac Posen, John Galliano, Badgley Mischka, Marchesa, Stephane Rolland, Kouture, Daniel Swarovski, Michael Kors, Rebecca Taylor, Tadashi Shoji, Tracy Reese, J. Crew Collection, and Pamela Rolland.